Alt+Scroll is in Xubuntu overloaded to have two behaviors: alter window transparency when mouse is positioned on title bar, or zoom otherwise. When I position the mouse cursor on a window title bar and scroll down, the window gets less transparent. As expected. If I scroll upwards, hoping to restore opacity, the view zooms in. If I zoom in to maximum magnification, the opacity-control resumes, and I can restore opacity to my windows. I would ideally like to be able to do both, but I don't want to zoom in to restore opacity to my windows. Is that possible? If so, how? SOLVED: Turns out it is the horizontal scroll on window decorator that causes the transparency change. I had foolishly turned that on and scrolled with a touchpad, inevitably scolling hotizontally on accident. Change the key used to grab the windows to something else. In Xubuntu 14.04, open Settings Manager from application menu. If you prefer command line, run xfce4-settings-manager in Terminal. Then, follow the instructions below. 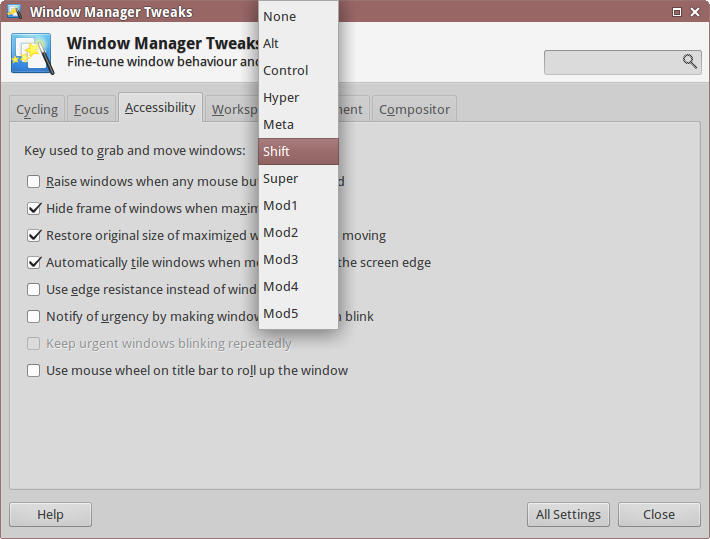 Under Personal category, click on Window Manager Tweak menu. In the first line, there is Key used to grab and move windows: option^ with a drop-down box, so click and change from the default Alt to other key of choice in the list. Finally, click on Close button to finish. I would suggest to use Shift key, because this key is rarely used for two-key combination shortcuts. This will avoid any conflicting shortcuts. Another choice is Super key, which is what I'm using now after feeling uncomfortable with the Shift key. Consider this: If Control key is used for the ^option in the Window Manager Tweak, this will cause Ctrl+Mouse click to be disabled. The shortcut is useful to open a link in background tab in Firefox and other web browsers. Changing the key to Shift will trigger the zoom function by pressing Shift+Mouse scroll keys and Alt+Mouse scroll on Xfwm title bar will trigger transparency as usual. This has been tested working on Xubuntu 14.04. Not the answer you're looking for? Browse other questions tagged 14.04 xubuntu shortcut-keys transparency zoom or ask your own question. How can I disable Alt-Scroll zoom in Xubuntu 14.04?